It's amazing how Potosi, at over 4000m out in the middle of the altiplano was one of the richest and largest cities in the world several hundred years ago. Why? The big hill behind the town, the Cerro Rica (Rich Hill) was the source for the bulk of the silver production in the Spanish empire from the mid 1500s on. The hill is completely perforated with mazes of interconnected mine tunnels and shafts, and is even a few hundred metres shorter than it initially was, for all the ore extracted! The mining continues today not too differently to how it was done for the last 400 years - it's all manual work. Health and safety is pretty much absent, and miners seldom live past their forties for all the toxic environments and accidents. They go in with picks and shovels and the odd stick of dynamite - and come out with bags full of rocks. Some more successful miners from the cooperatives have wheelbarrows - or even Indiana Jones style wagons that roll at shocking speeds silently through the tunnels. Watch out! It was an excellent opportunity to get to go into the mines, first seeing the processing plants then plunging into the mountain with just a head torch and wellies. The tunnels themselves are tiny, crumbling, wet and of course completely dark. Too often the wooden supports would fail - and at one point we had to negotiate our way around the rubble of a partial collapse. The air was both thin (at 4400 metres) and rancid - with the weird chemical stench constricting ones lungs even more. The miner guide assured us that we'd not suffocate from Carbon Monoxide - but that it was just the smell of the Arsenic and Cyanide. Great. Fascinating bursts of intricately shapes minerals would appear in seams, as well as odd goopy-looking stalagmites of slime. I didn't touch anything! It really felt a bit like a dungeons and dragons dungeon (It was on my mind seeing as I'd just finished Ultima IV on an Apple //e emulator - 29 years after I started!) especially as out of nowhere miners would appear and gruffly shuffle past. It was an amazing experience - but it wiped me out! Later that night I got slammed with altitude sickness - all that exertion at 4400m was no good at all for my body. I felt like hell laying in bed, but a couple of kittens came up out of nowhere to keep me company - which helped immediately. I didn't know how I felt about going into the mines at first. I was interested in finding out about the mining and especially the working conditions of the miners. However, I didn't want to expose myself to the dire conditions, especially the noxious fumes, and I did think that the tour would be a bit voyeuristic. In the end I am glad I went on the tour. I think it is important to see exactly where our minerals come from and the conditions that people go through to get them. It was also fascinating to see El Tio- the devil of the mines, who brings the workers more minerals and protects them and who they offer 96% sugar cane alcohol, coca leaves and cigarettes to. I was also glad when it was over and I was out into the light. Being inside a mine at 4400m when you have not fully acclimatised to the altitude is hard going and altitude sickness is no fun at all. 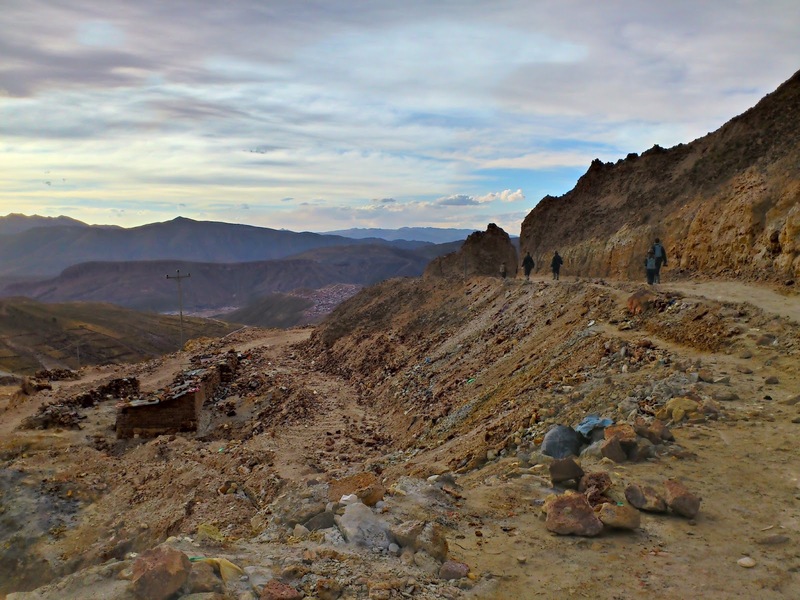 We only had a limited amount of time to spend in Bolivia so we needed to try and get across to Sucre as quickly as possible. This is no mean feat in Amazonian Bolivia where there are not many decent roads, incredibly slow buses and often road blockades due to strikes. The only option was to fly. After having our passports stamped we jumped into a tuk tuk like vehicle and went straight to the airport. It was not the kind of airport you would expect, but a dirt field with a temporary check in desk under a corrugated roof with some benches. A new terminal building was under construction but the work seemed to have come to a halt. There was a plane sitting in the field and we hoped that we may be able to grab a last minute deal. Unfortunately the price was too high and eventually we settled on a "negotiated price" for the flight the next morning. Ty paid the cash requested (no cards accepted) and received no tickets (slightly concerning). The airline company member of staff gave us a lift back into town and told us to come to the office at 8am for the flight at 9.30am. The next morning we waited outside the office for an hour and eventually got into a vehicle to go to the airport. There was no one there and no plane. After another hour and a bit waiting there was still no one at the airport and we wondered what sort of vehicle we would be getting on. Eventually a tiny plane landed and 3 people got off. It took around an hour to get to Trinidad, but that was not where we wanted to be. After some inquiries we had booked another two flights to get to Sucre on the same day. Finally we made it to our destination. However, we were 2750 metres above sea level which was a bit of a shock to the system after being in the Amazon for a while. Ordinarily, take-offs are no big deal for me. But when a barrage of alarms and warning sirens blares out from the cockpit in a 40-year-old propeller plane just as you lift off.... I definitely started to pay attention! It's amazing how flat the Amazon basin really is - and how the rivers meander and wind in such a serpentine way. I remember learning about meanders and oxbow lakes in high school geography - but this is crazy. 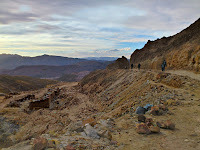 After a couple of days in Sucre (nice enough place), we got in a car winding up, up and up onto the altiplano and Potosi. Over 4000 metres in altitude! four days upriver making 3 knots. rivers of completely different colours mix and stay separated like a settling pint of Guinness. observing the highest flooding "since records began" and considering how the locals must be affected as their homes are inundated up to the rafters. Arriving in a port destroyed by the floods, having to clamber out onto a muddy bank. Then seeing the people in town just get on with it and start repairs. Eating the same food at the same regimented times every day for 5 days. At the blow of the whistle food was served: at 6.30am tapioca and a bread roll, 11.30 rice, chicken, beans and noodles, 5pm rice, chicken, beans and noodles. Twice we got beef! We would queue in a small canteen to serve ourselves. It felt a little like being at a boot camp or a prison. Escaping to our private cabin with aircon to get away from the humidity and the rain. Most passengers slept in hammocks on deck. Seeing Amazon dolphins. We saw a little piglet dolphin jumping by the side of the boat. I am glad we didn't see too many up close as they are pretty alien looking with their strange long beaks! A plethora of different types of birds including egrets, kingfishers, parakeets, macaws (from a distance) and a monkey in a tree. Reading all of the books I had, playing many games of parchis and monopoly and watching James Bond films to while away the time. It started to feel like ground hog day by around day 4. Eating an Easter egg on board on Easter Sunday. After one night in Porto Velho we took a taxi to the border town with Bolivia. Initially we had intended to take the bus but due to the flooding the bus had been re-routed and would take 20 hours on bumpy roads for a journey that had originally taken 6 on smooth! In the taxi we had drove through pot holed and muddy roads and a couple of times through quite deep water. One of the bridges had flooded and as the taxi made its way through the deep water the foot well on Ty's side flooded. Luckily he had his water proof shoes on! The water soon seeped out and we were on our way again. The taxi driver did a really good job and we arrived in Guayajara Mirin within 5 hours. There was a quick stop by the federal police to get our passports stamped and then we jumped on a little boat to cross over into Guayaramerin in Bolivia. The border town on the other side had also been completely flooded, including the customs and immigration so we had to hunt around town for the building so that we weren't entering Bolivia illegally. Eventually we found the building. It was closed. After waiting for around an hour, the workers showed up at 2.40. The official stamped our passports and at the end asked for a little something extra! Ty got out of it by saying 'no hablo espanol' and we were on our way.